Little Bytes: Form Triggers are Back! The popular Google Add-on that allows you to easily and automatically create documents and send emails using spreadsheet data just received a long-awaited upgrade. 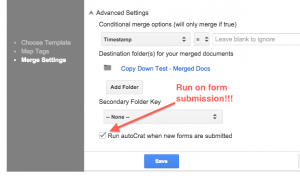 You can now automate AutoCrat to run on form submission...form triggers are back!